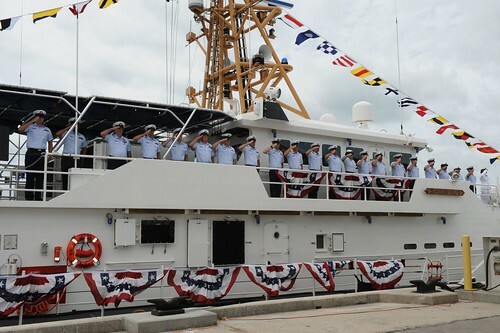 The Coast Guard commissioned the Coast Guard Cutter Isaac Mayo at Coast Guard Sector Key West, Fla., March 28, 2015. Mayo is the sixth Sentinel Class Fast Response Cutter to be homeported in Key West. Each FRC is named for an enlisted Coast Guard hero who distinguished him or herself in the line of duty. This vessel is named after Coast Guard hero, Isaac Mayo. In the spring of 1879 a raging snowstorm blanketed the shores of the Northeastern United States. The perilous seas and weather caused a three-masted schooner, the Sarah J. Fort to wreck on the shores of Cape Cod, Massachusetts. Mayo displayed extraordinary character during the disarray as he and his crew faced the storm to rescue the schooner’s sailors. Because of Mayo’s exemplary surfman and leadership skills throughout the challenging rescue, Mayo was awarded the Gold Lifesaving Medal on November 10, 1879. 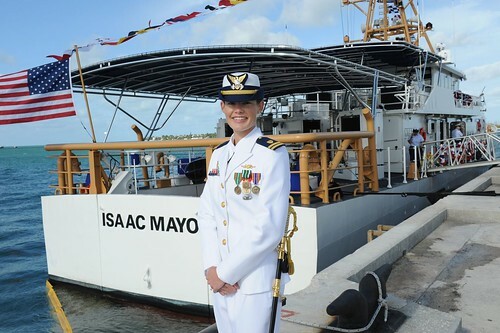 Lt. Ginny R. Nadolny, commanding officer of the U.S. Coast Guard Cutter Isaac Mayo, stands at the stern of the cutter Mayo before its commissioning on March 28, 2015 at U.S. Coast Guard Sector Key West. 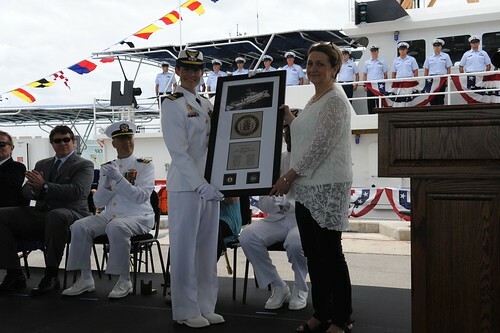 Fla.
Audie N. Dodson, sponsor of the U.S. Coast Guard Cutter Isaac Mayo, receives a plaque with the cutter’s coin from Lt. Ginny R. Nadolny, commanding officer of the Isaac Mayo, during the cutter’s commissioning ceremony at Coast Guard Sector Key West, Fla., March 28, 2015. 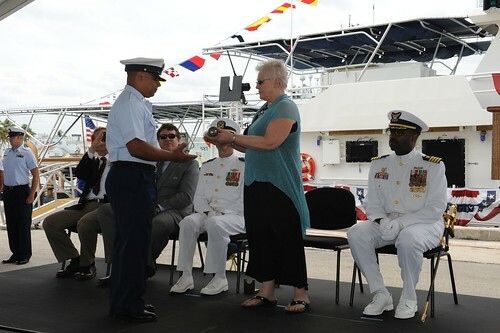 Cynthia Martin, the great-great-great granddaughter of Isaac Mayo, hands the first officer of the deck, Petty officer 1st Class Joel Ortiz, the ship’s long glass in the traditional ceremony of setting the first watch at U.S. Coast Guard Sector Key West, Fla., March 28, 2015. Crewmembers man the U.S. Coast Guard Cutter Isaac Mayo for the first time after its commissioning and salute symbolizing they have officially manned their stations, March 28,2015. 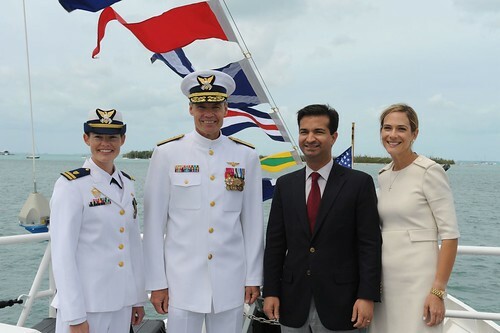 U.S. Representative Carlos Curbelo and Mrs. Cecilia Curbelo along with Rear Adm. Jake Korn, U.S. Coast Guard 7th District commander, and Lt. Ginny R. Nadolny, commanding officer of the U.S. Coast Guard Cutter Isaac Mayo, stand at the bow of the Isaac Mayo following the cutter’s commissioning ceremony at Coast Guard Sector Key West, Fla., March 28, 2015.